The California Department of Fish and Wildlife (CDFW) is now accepting applications for the 2016 Big Game Drawing. Applications for elk, antelope, bighorn sheep, premium deer tags and fundraising drawing tags may be submitted anywhere California fishing or hunting licenses are sold. Applications must be submitted before midnight on June 2, 2016. The 2016 California Big Game Hunting Digest includes proposed seasons, application instructions and drawing statistics. The digest is available online at wildlife.ca.gov/publications/hunting-digest. Big Game Tag Quotas can be found on the species webpages located at wildlife.ca.gov/hunting. Online Licenses Sales and Service, www.ca.wildlifelicense.com/internetsales, enables hunters to purchase licenses, apply for the big game drawing, review existing applications and preference points or find a local license agent. Telephone License Sales transactions, including purchasing all licenses and submitting drawing applications, can be conducted by calling (800) 565-1458. Any hunter who is under 18 years of age on July 1 of the license year qualifies for a junior hunting license. Junior hunters who are 12 years of age or older on July 1 may apply for apprentice deer, elk and antelope hunts. Hunters must be at least 16 years of age on July 1 to apply for bighorn sheep tags. Open Zone Deer Tag allows the hunter to hunt during the authorized season dates of any hunt, using the specific method and meeting any special conditions of the tag for that hunt. Grizzly Island Bull Elk Tag is valid in the Grizzly Island hunt zone, with any legal method of take. The hunt dates are from Aug. 6, 2016 to Sept. 4, 2016. Northeastern California Pronghorn Antelope Tag allows the hunter to hunt in any of the Northeastern antelope zones (Mount Dome, Clear Lake, Likely Tables, Lassen, Big Valley and Surprise Valley) with any legal method. The hunt dates are from July 30, 2016 to Sept. 18, 2016. Old Dad and Kelso Peak Bighorn Sheep Tag is valid only in the Old Dad and Kelso Peak hunt zone. If drawn, the hunter must attend a mandatory orientation to receive the tag. The hunt dates are from Nov. 5, 2016 to Feb. 5, 2017. Any person who is issued a deer tag must submit a harvest report for that tag, even if they did not hunt, or if they did not harvest a deer. Deer hunters who fail to submit a harvest report for any 2016 deer tag by January 31, 2017, will be assessed a $21.60 non-reporting fee when purchasing a deer tag drawing application or deer tag in the 2017 license year. Hunters have two methods to submit their harvest reports. Submit a report for each deer tag you are issued at wildlife.ca.gov/tagreporting. When you have successfully submitted your report online, you will receive a confirmation number. You must write the confirmation number on the harvest report card and retain the harvest report card until March 1, 2017. Tags reported online must be surrendered to the CDFW upon demand. By mail. Any person who does not report a deer tag online must return the report card portion of each deer tag by Jan. 31, 2017 to CDFW – Wildlife Branch, PO Box 944209, Sacramento, CA 94299-0002. Wildlife officials are investigating a bear attack that resulted in serious injuries early this morning in Mariposa County. 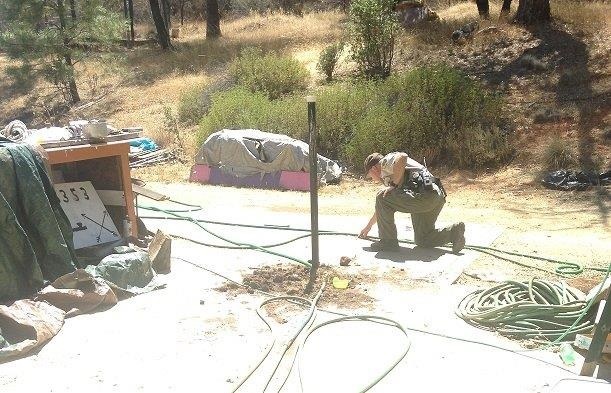 A CDFW warden investigates on site where a black bear attacked a man this morning in Mariposa County. The attack occurred in the town of Midpines, when the man stepped out of his house in the dark. A large black bear struck the man from behind, knocking the victim to the ground. The man fought the bear, and in the struggle sustained multiple puncture wounds and lacerations to his head, legs, arms, abdomen, hands and feet. Although injured, the man was able to get away from the animal and drive himself to the hospital, where he was treated and released later in the day. California Department of Fish and Wildlife (CDFW) officers and USDA Wildlife Service personnel are jointly conducting an investigation. The bear was not in the vicinity when investigators arrived, but tracking dogs will be used to follow its scent. Due to the severity of the attack, and the need to collect forensic evidence from the bear, it will be humanely destroyed when found. The Mariposa County Sheriff’s Office and CDFW are advising residents in the 5000 block of Colorado Road in Midpines to be aware of their surroundings and keep an eye on children and pets. Should you encounter a bear in that area, do not approach it and call 911. CDFW reminds residents to be bear aware, never leave trash outdoors and do not feed pets outdoors. In addition, all rural residents and recreationist should be mindful of nearby wildlife and potential risks of this type. Attacks on humans by wildlife remain uncommon but do occur on occasion. Basic safety and preventative actions greatly reduce the risk of attack. The California Department of Fish and Wildlife (CDFW) has posted the 2015 Big Game Digest to its website. The 64-page document can be downloaded online for free at www.dfg.ca.gov/publications/digest/. The popular guide includes season, quota and harvest information for deer, elk, pronghorn antelope and bighorn sheep, as well as tag drawing information, bear and wild pig hunting information and big game hunting regulations for the 2015-16 seasons. 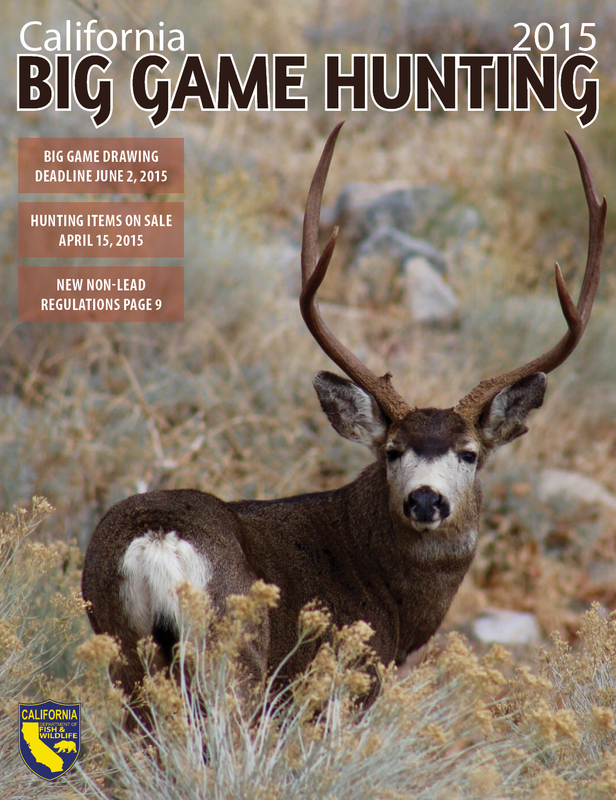 Printed copies of the Big Game Digest will automatically be mailed in late April to hunters who purchased a big game tag or applied for the Big Game Drawing in California in 2014. Hunting licenses, tags and drawing applications will be available on April 15. Purchases may be made through the Online License Service, at any CDFW License Sales Office or License Agent, or by telephone at (800) 565-1458. The deadline to apply for the Big Game Drawing is midnight on June 2. The California Department of Fish and Wildlife (CDFW) has successfully returned a yearling black bear back to the Los Padres National Forest near Lebec. The male cub was found in distress near the town of Lebec in August 2013. A wildlife officer safely captured the cub and it was transported by CDFW staff to the Lake Tahoe Wildlife Care facility for rehabilitation. To be eligible for rehabilitation, a cub must still be dependent upon its mother and not habituated to humans. CDFW works with rehabilitation centers like the Lake Tahoe Wildlife Center. The non-profit center relies completely on donations for their services. At the facility, cubs learn how forage for natural bear food such as berries, acorns, fish, grubs and insects. Human contact is kept to a minimum or is non-existent. By the time the yearling bears leave, each has quadrupled its size or more, to 50-80 pounds, depending upon body type. Upon release, each cub is given a final health checkup that includes taking hair and blood samples. In most circumstances, CDFW recommends that people leave wildlife alone, including removing attractants from their properties. If this is not an option, contact CDFW for guidance. For more information and how to live responsibly in bear habitat, please visit http://www.dfg.ca.gov/keepmewild/bear.html. Two northern California men have been sentenced to fines and jail time for unlawfully killing bears and selling their gall bladders and other parts for profit. Peter George Vitali, 56, of Pioneer and Arthur Martin Blake, 59, of River Pines, pleaded no contest to misdemeanor charges of illegally taking wildlife for profit in an El Dorado County courtroom last month. The court ordered Vitali to pay a $12,500 fine and Blake to pay a $5,000 fine. Both men will be required to serve 30 days in jail and were sentenced to an additional 36 month probationary period. Vitali and Blake were arrested by CDFW wildlife officers in April 2013, after they were found to be in possession of 20 large bear claws and three bear gall bladders in the El Dorado National Forest. Evidence developed during the investigation suggested the suspects recently killed three bears, likely a sow and two cubs. The claws, liver and gall bladder had been removed from the sow and only the liver and gall bladder were removed from the younger two bears. California Fish and Game laws forbid the sale, purchase or possession for sale of any bear part, including claws and gall bladders. The bile contained inside bear gall bladders is believed by some to have medicinal properties and is sold on the black market. Under California law, possession of more than one bear gall bladder is prima facie evidence that the bear gall bladders are possessed for sale.